A couple weeks ago, I was lucky enough to volunteer at Heritage Fire, a huge meat event held in St. Helena, CA. Put on by the folks who created Cochon 555, Heritage Fire had 25 chefs, 10 butchers and at least 2 dozen wineries. Someone told me they had an actual ton of meat, and while I can’t confirm that, with 6 pigs, 20 rabbits, a few lambs and goats and a bunch of chickens, it’s a figure I would entirely buy. In addition to countless delicious meat preparations, the day was filled with butchering demos. At the last one, a lamb, I was given the animal’s liverâ€”nearly two pounds of deep burgundy meatâ€”to take home. My lamb was raised by Long Meadow Ranch and Long Meadow’s own Avia Hawksworth handed me the liver. Having never cooked lamb liver before, I sought her advice, as well as Dave the Butcher’s. The preferred preparation, I was told, was liver and onions. Searching for a recipe the next day, I discovered an Albanian preparation that used lots of paprika, it sounded like just the ticket. 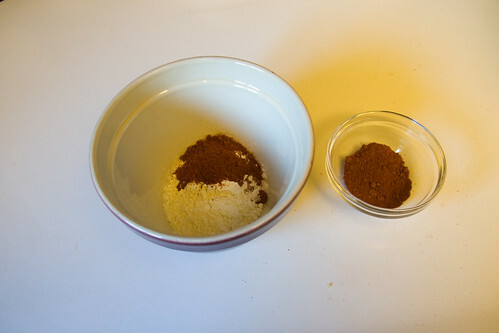 I began by mixing two parts flour with one part smoked paprika. Next I sliced two Walla Walla Sweets and arranged them on a platter. Walla Wallas are delicious, mild onions that don’t require much heat to bring out their sweetness. 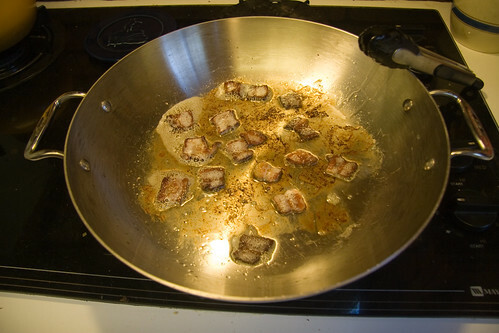 The heat from the cooked liver would be plenty to soften them. In my recipe search, I came across a few preparations that called for bacon, and while none of those recipes won out overall, the bacon seed was planted. Fortunately, I had a couple of slices that I needed to use, so I sliced them up and threw them in the pan. 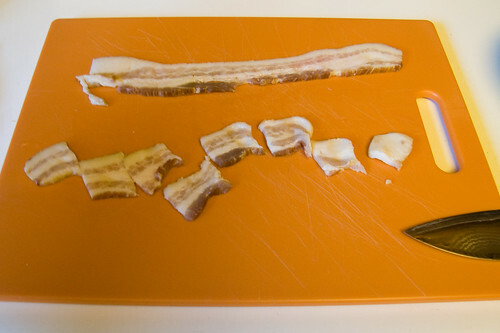 While the bacon cooked, I sliced the liver into thick strips. 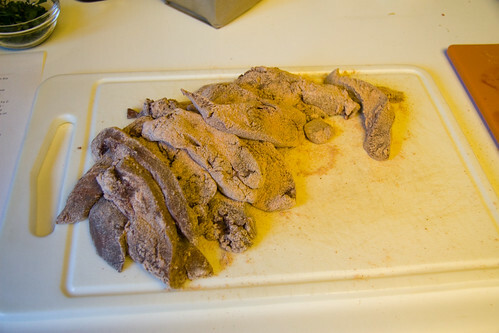 Then I covered the liver slices in the flour and paprika mixture. When the bacon was done, I pulled it from the pan, then used the bacon grease to cook the liver. 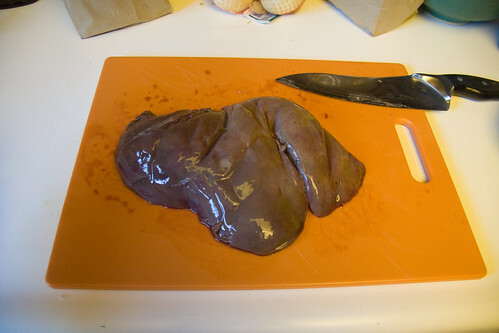 Liver cooks very quicklyâ€”a few minutes a slice. 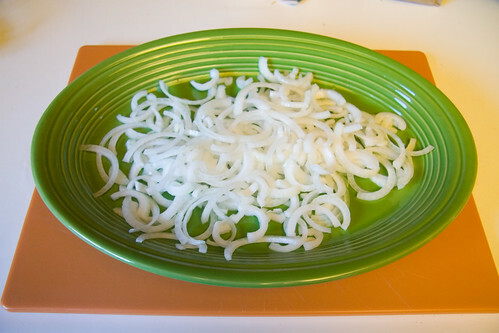 As each piece came out of the pan, I laid it on top of the onions. 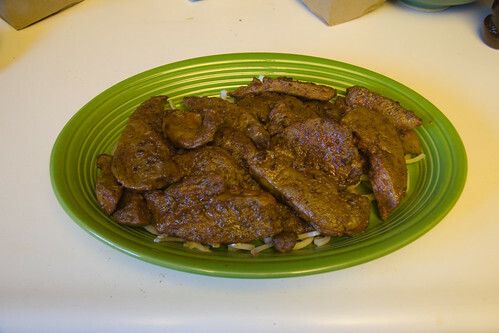 After cooking the liver, I threw a little garlic and more paprika in the pan, and deglazed it with some balsamic vinegar. I poured this on top of the liver and onions, then served it with rice. To be perfectly honest, enjoyment of this dish really hinges on one’s enjoyment of liver. 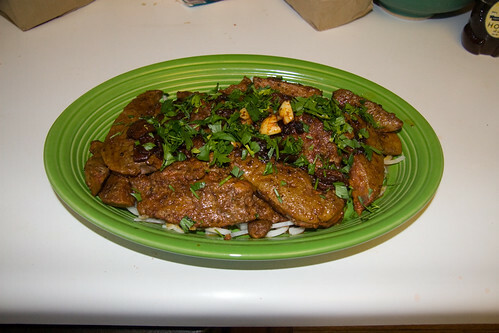 Lamb liver is pretty hefty, and one of my guests, who was not a big liver fan, bravely soldiered through. I found that the key to balancing the flavor was to mash a bit of liver onto a bacon piece and some onions, then scoop it onto a forkful of rice. We had a strong Rauchbier alongside it, and the liver held its own against the super smokey beer. There were lots of leftovers, and I also found that it was awesome spread in a sandwich with mustard, bleu cheese and pickles. 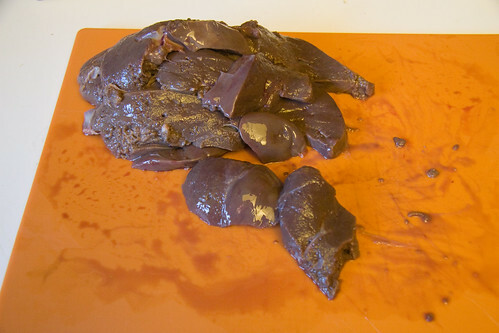 Lamb liver may be an acquired taste, but if you’re a liver fan you owe it to yourself to try it out. Hell, a butcher might even give it to you free.